How can I change the keyboard input options on my Samsung Galaxy Tab?S 8.4? You can change the keyboard settings on your device. From the Home screen, touch Apps > Settings > Language and input. Your device comes preloaded with Samsung keyboard and Skype®. You can specify the default keyboard by touching Default under Keyboards and input methods. NOTE: When entering text on the keyboard, touch and hold and then touch to access settings. • Input languages: Touch Select input languages to add input languages. When you select more than one language, you can quickly switch between languages on the keyboard by swiping across the space bar. • Learn from Facebook®: Sign in to your Facebook account to let the keyboard learn your writing style. • Learn from Gmail™: Sign in to your Gmail account to let the keyboard learn your writing style. • Learn from Twitter®: Sign in to your Twitter account to let the keyboard learn your writing style. • Learn from Contacts: Let the keyboard learn your writing style from your contacts' entries. • Clear server data: Delete all information stored anonymously on the server. • Clear personal data: Remove all personalized data stored on the device. • Auto replacement: Have your device complete or replace the word you are typing with the most probable word. Touch the slider to turn Auto replacement on. • Auto capitalization: Have your device capitalize the first letter of each sentence and proper nouns. • Auto spacing: Have your device insert a space between words. • Auto punctuate: Have your device enter a period at the end of a sentence when you double-touch the space bar. • None: Use the default key-touch entry mode. • SwiftKey Flow: Enter text by sliding your finger across the keyboard. • Cursor control: Move the cursor in the text entry box by sliding your finger across the keyboard. • Flick input: View symbols and alternative characters by quickly swiping upward on a key. • Sound: Have your device play a sound when you touch a key on the keyboard. • Vibration: Have your device vibrate when you touch a key on the keyboard. • Character preview: Have a preview appear when you touch a key on the keyboard, making it easier to verify that you are typing correctly. • Press and hold delay: Select the length of time a key should be held to display alternative characters. 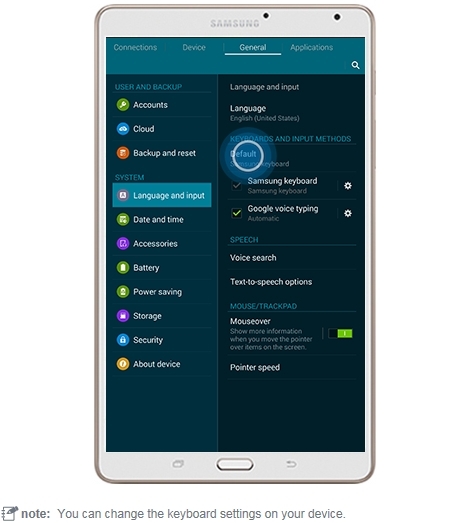 • Reset settings: Reset the Samsung keyboard settings, except personalized data, to their default values. NOTE: When entering text on the Swype keyboard, touch and hold to access settings. • Vibrate on keypress: Have your device vibrate when a key is touched. • Sound on keypress: Have your device play a sound when a key is touched. • Pop-up on keypress: Display the character briefly when a key is touched. • Long-press delay: Set the amount of time you need to select alternate characters during a long-press. • Show complete trace: Display the complete Swype path of each word. • Auto-capitalization: Have your device capitalize the first letter of each sentence. • Auto-spacing: Have your device insert a space between words. • Next word prediction: Predict words based on the previously entered text. • Show voice key: Display the Voice key when using Skype. • Keyboard height: Choose the height of your keyboard in Portrait and Landscape orientations. • Word choice list font size: Increase or decrease the font size of text in the Word Choice List. • Backup & Sync: Automatically back up and sync your personal dictionary. Touch the slider to turn Backup & Sync on. NOTE: You must be connected to a Wi-Fi® network or allow the Skype Backup & Sync option to use Cellular data. • Account: View the account registered with Skype. • Devices: View all devices associated with your account. • Sync now: Synchronize data with Skype. • Delete account: Unregister all devices and delete your account. • Import recent contacts: Let the keyboard learn new contacts' names as you add them. • Living Language: Automatically update Swype with popular new words. • Social integration: Let the keyboard learn from your Facebook, Twitter, and Gmail activity. • Edit my dictionary: Manage custom words, usernames, and contacts added to your personal dictionary. • Clear language data: Delete all personal language data, including your words. • Contribute usage data: Let Nuance® collect data from your device to improve predictions. • Cellular data: Allow Skype updates over your mobile data connection. • Languages: Change the language selection and download additional languages. Touch to choose an alternative keyboard arrangement. • Gestures: View keyboard shortcuts you can use to quickly accomplish certain tasks. • How to Swype: View introduction guides on how to Skype. • Show helpful tips: Display helpful hints on how to use Skype. • Version: View the version for Skype. When entering text, open the Notification Panel by swiping from the top of the screen to the bottom and touch Select input method. Or, from the Language and input settings menu, set the default keyboard by touching Default.